I don’t know about you, but when I’m making a “major” meal in the Italian manner, I tend to focus on the primo and the secondo. More often than not, I pick up dessert at a local bakery. And the antipasto? Well, when I’m pressed for time—and that tends to be most of the time these days—it tends to be a plate of affettati misti, some olives, perhaps a wedge of provolone. But lately I’ve been having some second thoughts. After all, the antipasto course is the first thing my guests will experience, so perhaps I should give it some more attention. But how to make a big first impression without adding too much to that pre-dinner party stress? While some are quite elaborate, a homemade antipasto can be very simple, something that doesn’t add too much time and effort to your dinner plans. 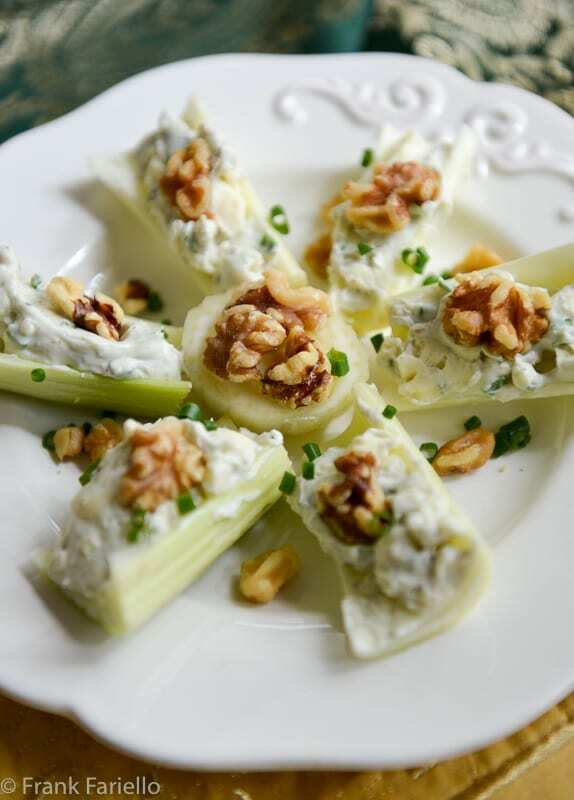 A good example are barchette di sedano con gorgonzola e noci, “celery boats” filled with gorgonzola cheese, toned down a bit with mascarpone, and topped with pieces of walnut. It’s a dish that might take you, say, 15 minutes to prepare. And best of all, you can make your celery boats ahead, stick them in the fridge while you’re making the main courses and, about half an hour before you’re ready to serve, take them out so they can come back to room temperature. So easy it’s practically a “non-recipe”, I find that this dish always makes a fine impression, especially nice with cocktails. Trim the celery top and bottom, then cut the stalks into lengths that will resemble little canoes or, in Italian parlance, “boats”. I like my boats about 5cm/2 inches long, but the exact length is up to you. Fill the insides of your celery boats with the cheese mixture. Top each boat with one or more pieces of the walnuts. Arrange on a serving plate. If you like, sprinkle with more walnuts, chives and/or black pepper. If making ahead, refrigerate your celery boats until about 30 minutes before you’re ready to serve. Recipes for barchette di sedano con gorgonzola e noci vary, but I prefer a sharp (piccante) gorgonzola for this recipe, rather than the mild (dolce) variety. You could certainly substitute another blue cheese you like for the gorgonzola. And instead of mascarpone, another mild cream cheese like robiola works well. Philadelphia cream cheese is actually not a bad substitute. If you find the mixture is a bit too stiff, just add a few drops of milk or white wine to soften it. The ratio of gorgonzola to cream cheese varies from recipe to recipe. I find this 2:1 ratio works well for sharp gorgonzola, but you can certainly vary it. The more cream cheese, the milder the flavor will be, of course. Walnut halves are ideal for this recipe, but you could also use roughly chopped walnuts. And for a more “upscale” take on this dish, try using Belgian endive or radicchio leaves for your “boats”. Just a delicious. Maybe even more so—I personally really like the contrast between the crispy bitterness of the endive and the creaminess of the cheese mixture. Trim the celery top and bottom, then cut the stalks into lengths that will resemble little canoes or, in Italian parlance, "boats". I like my boats about 5cm/2 inches long, but the exact length is up to you. If making ahead, refrigerate your celery boats until about 30 minutes before you're ready to serve. Just made these for guests the other night! Can’t get over how great they tasted…used Belgian endive only…even the two year old son of our friends liked it! High praise I think!!! Gorgonzola and walnuts pair so deliciously! We add them both in some salads and the everyone loves the combo. Toning down the sharpness of the Gorgonzola with Mascarpone sounds really great. We’ll try this out soon and perhaps also try a couple of fresh lemon drops in each boat (we wonder if some acidity would enhance this or it won’t work at all lol). Simple, quick, easy to make AND delicious; the perfect appetizer! Great work (again), kudos Frank! I really love this. It’s an elegant take on a familiar dish. Beautiful presentation, too! I think the idea of cutting the blue with mascarpone is brilliant! At Thanksgiving and Christmas, my mother always served celery stuffed with cream cheese and chopped pecans. Your Italian version would make my mother smile. The sophisticated version of the celery stuffed with pimento cheese of my Southern youth! Looks delicious. Thanks, Michelle. Different flavors but the same basic culinary idea. Like so many dishes that cross cultures. It’s a fascinating subject all by itself. They should write a book about it. I love blue cheese from any country, especially gorgonzola. And I think you hit on a delicious and easy idea for an antipasto. My favorite kind of cheese, Linda. I love this so much more than the 50s version with peanut butter and raisins! The flavor and texture combination sounds quite amazing, Frank! I love Gorgonzola and will definitly make these. Years ago I used to stuff celery with peanut butter for the kids. Yours is more appealing to me. confesso che fra me e il sedano non c’è affatto feeling….Li sopporto in piccolissime quantità quando sono accompagnati da altri ingredienti . Riconosco però che forse il gorgonzola con il suo sapore deciso potrebbe coprire il gusto del sedano quel tanto da farmelo assaggiare ! Buona settimana Frank ! Indeed, it’s very nice with Belgian endive! I’ve always made this with Belgian endive, or, in season, radicchio. Easier to eat than celery. I also tend to use celery more for seasoning stock and for the many mixtures of finely chopped vegetables used in different cuisines as a basis for stewed and braised dishes. I’m very interested in ways to use walnuts in recipes as it seems that they are a nutritional powerhouse (used even more in the cuisines of the eastern Mediterranean), but like nutritious avocados, they are also very high in calories and fat so I don’t want to just chomp on them like potato chips. I like them very much and they are easier to digest than some of the “harder” nuts, but not being 20 any more, have to watch portion sizes! Actually, often inviting friends now, we have meals that are more like aperitivi or tapas with many little dishes (like a more refined potluck). These could also include little meatballs, many other things. I can’t imagine that this is anything but good. I am trying to imagine what mascarpone and gorgonzola might taste like in my mouth and it definitely has me interested. Definitely worth a try, Ben! PS Our Wegman’s scoops out from a large wheel gorgonzola dolce! I actually think cream cheese makes a fine substitute, but mascarpone does take it up a notch. Simplicity at its finest – perfect for chatting with a child glass of prosecco. I love celery with cream cheese but this brings it to the next level! I certainly does… worth a try! These are lovely, though I tend to use endive or radicchio (in season) endive is very common here in Montréal, as is radicchio in season – see http://www.milanofruiterie.com, a short walk from my house – trilingual site – scroll down to foot of page for Italian or English. Jean-Talon Market has endive all year long – our Belgian community couldn’t live without that! Looks like a great store. Would love to have a place like that close by. It is wonderful. About 10 minutes’ walk from my house. Today I also popped into the Greek PA supermarket and a Lebanese one. Missed the Vietnamese today; too much work! You are so right, Frank! We Italians are all about good food but also about family and friendship. If we’re slaving away in the kitchen and letting our friends/family fend for themselves that is not enjoyable. I love preparing as much ahead of time as possible. Your boats are great. I’ll be trying them out!! Fantastic. Do let us know how you like them. This is a beautiful appetizer, Frank! Like you, I tend to concentrate on the main course when entertaining. I usually rely on things that I pick up at my upscale grocery store’s deli for appetizers. Your celery boats would be a great alternative. I’ve “pinned” this one to save for later. Thanks! I love these! I wouldn’t have thought about mixing Gorgonzola with mascarpone. Great idea, thank you. Do hope you like it, Susie.